Digital Surrogates from the President Arthur Willard General Correspondence Records, contain digitized typewritten and handwritten letters, memoranda and budgets concerning an amendment to the Agreement between the University and the State Department of Public Welfare, regarding the operation of the research and educational hospitals, primarily the Neuro-Psychiatric Institute. Main correspondents include of President Arthur Willard, Dr. Eric Oldberg (Department of Neurology and Neurological Surgery, college of Medicine), D.J. Davis (Dean of the college of Medicine), A.L. Bowen (Director of the State Department of Public Welfare), Judge Sveinbjorn Johnson (University Counsel), Douglas Singer (Head of the Department of Psychiatry, college of Medicine), Raymond Allen (Executive Dean, College of Medicine). Original files can be found in record series 2/9/1, Box 54. 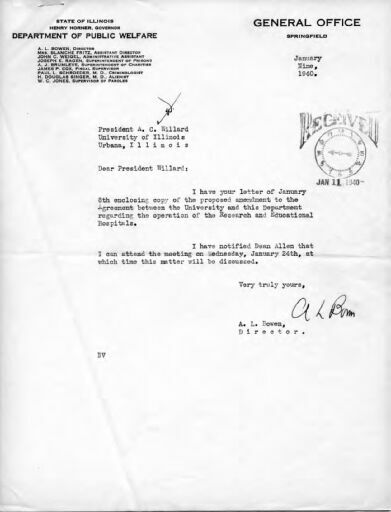 The President Arthur Willard General Correspondence Records (Digital Surrogates), 1937-1940 are managed by the University of Illinois Archives and do not feature precise descriptive information for each item. Discover their contents by browsing the folders and files. For more information, contact an archivist at illiarch@illinois.edu.